Read about Barbara's inspiration for this design. Earn your wings in the most eye-catching way with this sterling silver and 18K rose gold enhancer from Barbara Bixby. Bead-bordered mother-of-pearl angel wings surround a prong-set, oval amethyst with a signature flower featuring an iolite and rose gold bead at the bottom. A white cultured freshwater pearl hangs from the bottom, finishing the piece and sending your look soaring. From Barbara Bixby. Barbara Bixby Sterling & 18K 5.20 cttw Amethyst Angel Wing Enhancer is rated 4.7 out of 5 by 9. Rated 5 out of 5 by loves to reid from Just BEAUTIFUL!! Everything about this enhancer is elegant And wonderful.The carved wings are outstanding an the deep purple of the amethyst really sets off the piece I love this enhancer and I am so glad it went on easy pay so I could afford it. Rated 5 out of 5 by jahwmu from Just Beautiful! So much detail in this enhancer. Love the deep purple amethyst and iolite accents. The carvings on the wings are perfect. Bought this soon after Prince passed, thought it a fitting tribute to the Purple One. Rated 5 out of 5 by Hopper53 from Amazing Quality and Beauty This enhancer is wonderful to look at, the amethyst stone is a royal purple color, the iolite flower is beautifully done with the rose gold in the center. The pearl hangs freely not tight at all, and the wings are beautifully carved. This may just be my favorite piece of art from Barbara Bixby, I'm so glad I finally purchased this, it does give me a "peaceful" feeling when I wear it. I love it! Rated 5 out of 5 by Southamk from BEAUTIFUL PENDANT! First off, Barbara Bixby is one of my favorite designers. Her pieces resonate with me, and I have amassed quite a collection of her gorgeous pieces. 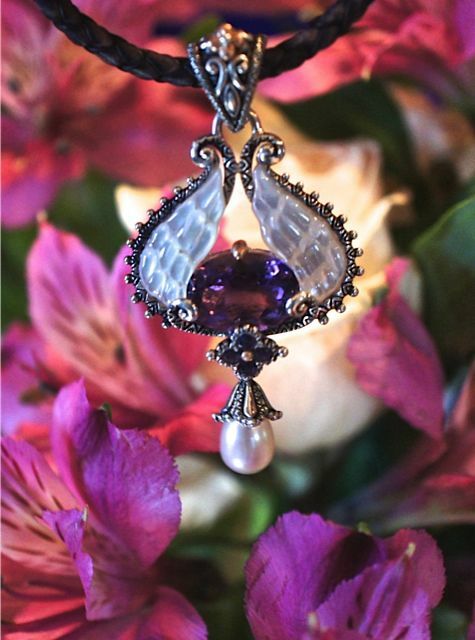 This Amethyst Angel Wings pendant is quite stunning and holds special meaning. I lost my husband suddenly and unexpectantly last Christmas Eve to a heart attack. I purchased this pendant as a remembrance to myself that he is among the Angels now and watches over me from the other side. Thank you QVC and Barbara Bixby for bringing us this beautiful pendant. I will cherish it. Rated 3 out of 5 by Sunchine from Bixby but in wrong packaging This enhancer is a stunning piece of artwork. I have not worn it yet so I am not sure how the pearl will hang. The only issue I have is that it came in a Judith Ripka box and pouch! No mention of Barbara anywhere! Rated 4 out of 5 by KC in SoCal from Very Beautiful and Uplifting I bought this enhancer to help me through my journey with Stage IV cancer. The carved mother-of-pearl angel wings especially glow with warmth and beauty. I wear it often and have received many compliments. The only reason I am giving it 4 instead of 5 stars is that the connector ring for the hanging pearl is too small. This makes the pearl often skew and hold in a horizontal position instead of hanging straight down. In the product description you can see how tight that connector ring fits when you view the pic of the back of the enhancer. You have to manually work the pearl back down into a hanging position again whenever this happens. Otherwise, this is one of my favorite Bixby pieces. Rated 5 out of 5 by parmour from Absolutely Stunning !!! I've been searching for a long time for the perfect angel wing pendant, and I've finally found it. The carved mother of pearl makes the wings appear real, and the amethyst is quite large and the perfect dark purple color. Don't miss out on this one!! Rated 5 out of 5 by Anonymous from Awsome The purple stone is awesome, the wings are heavenly, the pendant is just right in size. I originally bought it in remembrance of my deceased mom. The previous comment of Prince got his wings, adds so much more. This pendant is AWSOME!